Turkish yacht builder Sunrise Yachts has delivered its 45-metre superyacht, now named Atomic. Called Project Sunset when she was launched by Sunrise, the yacht was commissioned for an American owner and ordered at Sunrise in July 2013. Superyacht Atomic is hull No 2 in the Sunrise Yachts 45 metre series. She follows the launch of Dynasty (formerly Africa) in 2009. Naval architecture is by Sunrise Yachts and Karatas Yacht Design. 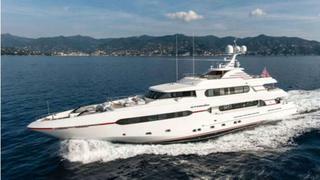 The full-displacement, steel-and-aluminium superyacht has a 499 gross ton volume and features spacious deck heights. Interiors are by Franck Darnet Design in Nantes, France, who also was responsible for the interior of hull No 1 in the series. Yet the two interiors are night and day – Dynasty's featuring dark, tropical woods and Atomic has a contemporary interior with light veneers and bright colours. Powered by twin MTU 12V 2000 M70 engines, she has a maximum speed of 15 knots and a transatlantic range of 5,000-plus nautical miles. Atomic will be at the Fort Lauderdale boat show this month.